The 2017 US Open had its own unique cadence from the very start, and even before. One famous pregnancy and some assorted injuries fleeced the draw of past champions Serena Williams, Novak Djokovic, Andy Murray and Stan Wawrinka, with finalists Victoria Azarenka and Kei Nishikori also unable to make the journey to Flushing. More big names quickly followed them through the turnstiles. No. 2 seed Simona Halep and No. 7 Johanna Konta were vanquished in the first round, and No. 5 Caroline Wozniacki, No. 6 Angelique Kerber and No. 8 Svetlana Kuznetsova all lost in the second. And that was nothing compared to the bottom half of the men’s draw, which extinguished its full complement of Top 10 seeds and any former Grand Slam finalist – and all but one past major semifinalist – by the end of Round 3. But with those early exits came new stars – Naomi Osaka, Andrey Rublev and Denis Shapovalov, to name a few – the return to glory from injured fan favorites Juan Martin del Potro and Petra Kvitova, and a semifinal run by the beloved grand dame of the women’s game, Venus Williams. Amid all the madness, there was wonder, the kind that only the toughest two weeks in tennis can deliver. And in the end, there were champions, and two very deserving ones at that. Unseeded Sloane Stephens emerged from an all-American women's semifinal round – the last four in the women’s draw all hailed from the U.S. at the US Open for the first time since 1981 – as a most appropriate champion for an upset-addled draw. Just six months ago, she was confined to a wheelchair, rehabbing a foot injury that required surgery and kept her off the tour for 11 months. On Saturday, she hoisted the women’s singles trophy, a Grand Slam victor in her first major final, a player who survived four three-set matches – and two third-set tiebreaks – to prevail. Rafael Nadal needed no such drama. The top seed claimed the championship in emphatic fashion, defeating surprise finalist Kevin Anderson in a one-sided final to win his third men’s singles title and further solidify his place as one of the Open’s all-time champions. There was, yet again, no match against Roger Federer – the Swiss was upset in the quarterfinals by del Potro, one round shy of facing Nadal for the first time in New York – but that made no matter to the Spaniard. He took on all comers, upstarts and former champs alike, and dismissed them all. But while Stephens and Nadal claimed the headlines, they were hardly the only champions. Winners were crowned in disciplines ranging from mixed doubles to junior singles to wheelchair doubles, all earning their rightful place as US Open titlists. And with that, let’s take a look back at the tournament that was: the 2017 US Open. The list is impressive, even by Hall of Fame standards: Jimmy Connors, Roger Federer, Ivan Lendl, John McEnroe, Pete Sampras – and now, Rafael Nadal. With his 6-3, 6-3, 6-4 victory Sunday over surprise finalist Kevin Anderson, the King of Clay added a pretty impressive hard-court accomplishment to his glittering resume: a third US Open singles title, making him just the sixth man in the Open era to achieve that mark. 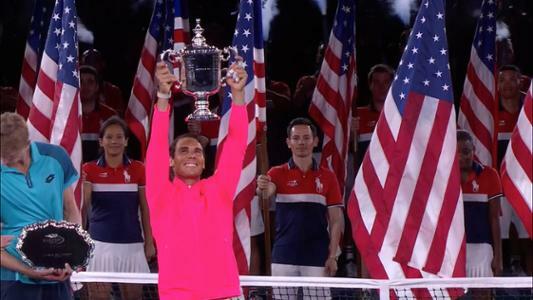 Of course, Nadal hardly needed a third US Open trophy to validate his career. But for those who take the measure of a (tennis) man by his majors, it certainly didn’t hurt. The Spaniard has now won 16 Grand Slam singles titles, three behind Federer for the all-time men’s mark and two clear of any other men’s competitor in history. And even if you remove his 10 (10!) French Open titles, Nadal would still own six majors – equal to such Open era greats as Boris Becker and Stefan Edberg and just one behind McEnroe. Nadal’s road to the 2017 US Open title was not daunting – he faced no seed higher than No. 24, though that opponent was Juan Martin del Potro, a man whose caliber far outweighed his spot in the draw – but his play more than made up for it. The last three sets of his 4-6, 6-0, 6-3, 6-2 semifinal victory over del Potro were as fine as anyone has produced on a hard court in recent memory, and really, Nadal was never threatened during the fortnight. When the match was over, his backhand volley having found nothing but open blue court, Nadal turned toward his box and raised his arms in celebration. 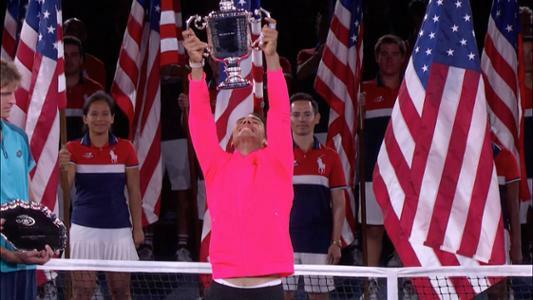 A year that began with questions over whether he would ever regain his old form ended in triumph: his second Grand Slam title of the year and his third in Flushing Meadows. It’s the stuff of legend, all performed with muscular artistry by one in the making. Once again, Juan Martin del Potro emerged as one of the most endearing and enduring storylines of the US Open. But he was, for all intents and purposes, done in the fourth round. Del Potro took the court for his round-of-16 match against No. 6 seed Dominic Thiem visibly sick. Drained by a virus, he put up little fight in the opening two sets. Thiem, meantime, was in full flight, his leaping backhands and rolling forehands painting every line and finding every corner of the Grandstand court. The first two sets took just over an hour, with Thiem surrendering just three games. The buzz surrounding the encounter centered more on if del Potro would retire than if he could come back. But then he did, seemingly flipping a switch and blitzing a stunned Thiem to take the third set. Then the match really got going. Del Potro broke early in the fourth set; Thiem immediately broke back. Then the No. 6 seed broke again, pulling ahead 5-2 and pushing the Argentine to the brink. But with his opponent serving for the match, the 6-foot-7 del Potro stood tall, breaking again to extend the affair. Undaunted, Thiem secured two match points with del Potro serving at 5-6; the 2009 US Open champion erased both with aces. Then he started rolling. 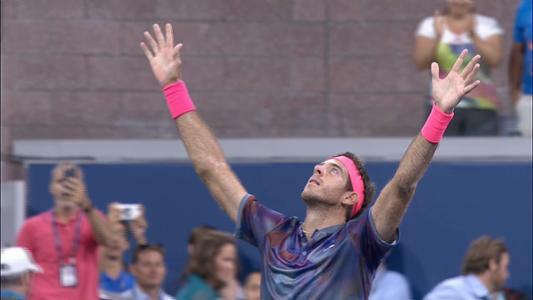 The tiebreak was one-way traffic, Delpo running out to a 6-1 lead and securing the set with a cannonball of a forehand that is sure to be among the hardest the US Open has ever seen hit – a resounding strike that sent the standing-room only crowd into a state of utter delirium. Then everyone took a deep breath, and the fifth set began. It did not disappoint. Thiem brushed away triple break point at 3-2, bottling a crowd that was ready to erupt. But in the end, he was only delaying what seemed like the inevitable. At 5-4, on del Potro’s second match point, Thiem spun a second serve that was called an ace. Del Potro challenged; the ball was wide. The match was over, Thiem leaving the court and the stage to the Argentine, who raised his arms to the sky as the crowd showered him in cheers. There were other great matches during the 2017 US Open – Venus-Kvitova, Vandeweghe-Radwanska, Young-Monfils – but for sheer drama, played in the intimate Grandstand before boisterous fans, there was no other match like this one. In a tournament rife with upsets, nothing reverberated through the record books quite like Naomi Osaka defeating Angelique Kerber in the opening round. While the scoring was surprising – a 6-3, 6-1 pasting – the result was not necessarily a shock; the 19-year-old Osaka is a rising star in the women’s game and Kerber had labored through a desultory season, entering the Open absent a Top 20 win on the year. But history matters in these matters, and with the loss, Kerber became just the third defending champion in tournament history – since 1887 – to lose in the first round. The others were an injured Patrick Rafter, who was forced to retire in the fifth set against Cedric Pioline in 1999, and Svetlana Kuznetsova, who dropped her 2005 opener to Ekaterina Bychkova. Osaka would go on to reach the third round, admitting that the attention that followed her Kerber win took a bit of a toll. 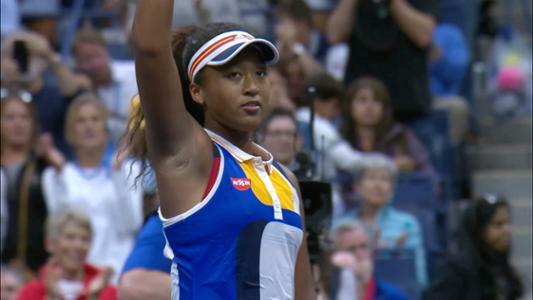 But the Osaka product – really, she was born in Osaka, Japan – and Florida resident nonetheless charmed the Open with her talent and personality, and her dynamic game is one that should translate to Flushing’s concrete floors for years to come. 83: The ranking, entering the 2017 US Open, of eventual women’s champion Sloane Stephens. It is the lowest rank ever for a US Open singles champion in the Open era, and Stephens is just the second unseeded woman to hoist the trophy – alongside Kim Clijsters, who actually did not have a ranking when she won here in 2009 – and the third overall, joining 1994 men’s winner Andre Agassi, who was No. 20 in a draw that then seeded only 16. Stephens’ ranking, of course, did not reflect her ability. The former world No. 11 tumbled to No. 957 in the world entering August, the product of 11 months off the tour due to a foot injury. But while she was considered a dangerous floater in a wide-open draw, no one predicted a title. So Stephens surprised us all, outlasting Venus Williams in a third-set tiebreak in the semifinals and betraying no nerves in a masterful 6-3, 6-0 victory over Madison Keys in the final. When the new rankings come out on Monday, Stephens will be No. 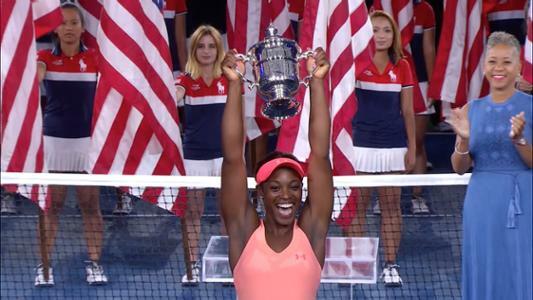 17 – a stunning rise of 940 ranking spots in a month-and-a-half – a fun side note to the real story: Sloane Stephens is the 2017 US Open women’s singles champion. September 9, 2017 - Madison Keys in action against Sloane Stephens in a Women's Singles Final match at the 2017 US Open. 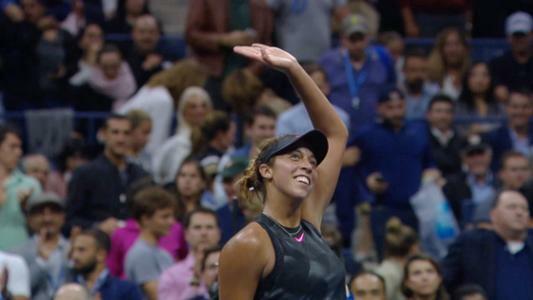 “I’m going to immediately get into bed and sleep until 3 o’clock tomorrow.” – Madison Keys, who wrapped up her third-round victory at 1:45 a.m., the second-latest finish for a women’s match in tournament history, on how she planned to prepare to face No. 4 Elina Svitolina in the fourth round. Keys would win that match, and also her quarterfinal over Kaia Kanepi and her semifinal over CoCo Vandeweghe, to reach her first Grand Slam final. The US Open will celebrate 50 years of Open tennis in 2018, with the best in the game once more arriving in New York for the year’s final Grand Slam. Potential top storylines include the return of six-time women’s champion Serena Williams, the continued pursuit of a Federer-Nadal US Open showdown and whether Sloane Stephens and Rafael Nadal can repeat their 2017 championships – once more etching their names into the US Open trophies and their names into the tennis record books.